New Pork City is the name of an EarthBound stage featured in the game, Super Smash Bros. Brawl. Its name is a pun on New York City. The stage is from Lucas' game, Mother 3, and is the largest stage in Super Smash Bros. Brawl, and contains several hazards. The stage can be compared with the Temple from Super Smash Bros. Melee, by the fact that its size and blockades allow players to run and hide from their opponents with ease. The lower wooden platform can be destroyed with a few hits. Also, a statue of Porky, Ness' rival and Mother 3's main antagonist, can be seen in the right side of New Pork City. New Pork City reappears in Super Smash Bros. Ultimate. In this game, the undersides of the floating solid platforms are colored purple instead of yellow. 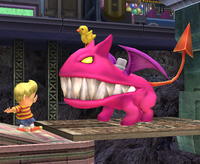 The Ultimate Chimera is a character in the game Mother 3, and a gimmick in Super Smash Bros. Brawl and Super Smash Bros. Ultimate. It only appears on the New Pork City stage of the game, where it randomly appears anywhere across the stage, and starts attacking the players. The creature is invincible, and any attempts at damaging it or knocking it away fail. If the Ultimate Chimera manages to attack the players on the stage, it instantly KOs the players (unless an obstacle stops them), sending them flying across the stage. Each bite deals 100% if the player is by the edge of the Chimera's mouth, and 200% if trapped inside. In the event that the Ultimate Chimera ends up on a breakable platform, the player can use an attack to destroy the platform causing the Ultimate Chimera to fall and respawn on the field in another area. The stage selection screen lists New Pork City as an area from EarthBound, though it actually appeared in Mother 3. It is however, from the EarthBound / Mother universe. This page was last edited on March 12, 2019, at 18:39.